Wild horses at the International Society for the Protection of Mustangs and Burros near Lantry, S.D. Photo by Chris Huber. Return to Freedom and other members of the wild horse and burro sanctuary community have launched a new organization, the Wild Horse and Burro Sanctuary Alliance, to help address sanctuary emergencies and bolster sanctuaries over the long term. The Alliance has arranged for several shipments of hay to be sent to the South Dakota wild horses in need. DUPREE, S.D. 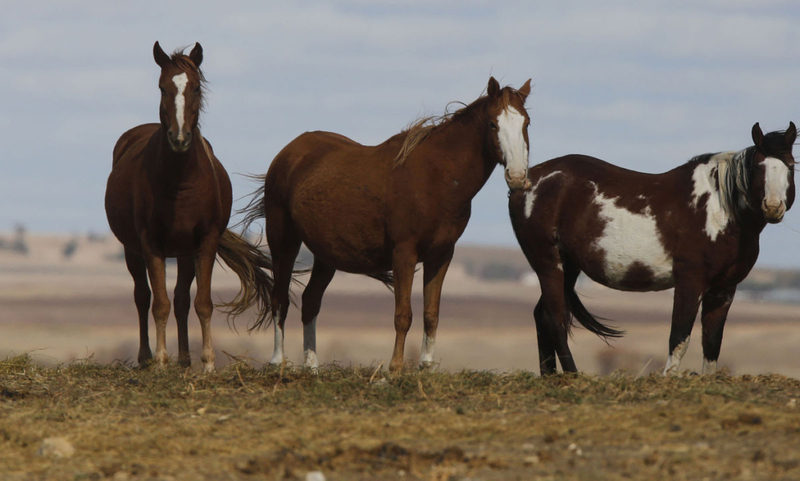 — A judge on Tuesday ordered two county governments to take control of an estimated 650 wild horses at a north-central South Dakota sanctuary where some horses have reportedly died of starvation-related causes. The terms of the impounding give the sanctuary near Lantry an opportunity to regain some horses, but the terms also allow for the adoption or sale of healthier horses and the euthanization of any horses deemed too weak to survive the winter. Dewey County State’s Attorney Steven Aberle told Circuit Court Judge Jerome Eckrich during Tuesday’s hearing at the Ziebach County Courthouse that the sanctuary will likely see at least a reduction in the number of horses under its care. “I think there’s a recognition on behalf of the organization that the herd has grown beyond a size that can be adequately cared for,” Aberle said. Aberle jointly requested the impounding with Ziebach County State’s Attorney Cheryl Laurenz-Bogue. The sanctuary is operated by the nonprofit International Society for the Protection of Mustangs and Burros (ISPMB) on a small ranch that straddles the border between the two counties, near the towns of Dupree and Lantry, about 110 miles northeast of Rapid City. The horses will be impounded at the ISPMB ranch, where the organization and its president, Karen Sussman, will be relieved of feeding and caring for the animals. Those responsibilities will fall to the sheriffs of the two counties, and the costs will be borne by each county government. Large quantities of hay will be needed to keep the horses alive, because the overgrazed pastures at the ranch are devoid of grass and the ISPMB does not produce a hay crop or have enough money to buy hay for the winter. The organization has estimated that the cost to buy hay for all the horses is $10,000 per week. Donations to offset the costs incurred by the two counties are being accepted by the Dewey County Auditor’s Office, and so far $3,090 has been donated. Additionally, reimbursement of the costs by the ISPMB is listed as one of several conditions for the return of any horses. The conditions are part of a written agreement struck by the two county prosecutors with Sussman, operator of the ISPMB. The agreement first requires a veterinarian from the state Animal Industry Board to evaluate the horses immediately and sort them into three groups. Horses deemed healthy enough to survive the winter will be maintained in their respective herds, while those needing immediate care to survive the winter will be separated for treatment and then either allowed to return to their herds or offered for adoption. Animals deemed unlikely to survive the upcoming winter will be euthanized. Meanwhile, the ISPMB must meet several conditions and deadlines to regain any of the healthier horses. Within 10 days, the organization must submit a comprehensive, 18-month management plan for review by the two county prosecutors and the state Animal Industry Board. If the plan is judged to be adequate, the ISPMB would then have to prove by Nov. 11 that it has adequate funds, feed or both on hand for 18 months of operations. The organization would also have to reimburse the counties for the costs of the impounding and submit to close financial scrutiny, including approval of expenditures by a representative of the counties. Depending on the extent to which the ISPMB complies with the deadlines and conditions, the organization could get some, all, or none of its horses back. The agreement allows for any remaining impounded horses after the Nov. 11 deadline to be adopted by Dec. 1. After that, any remaining impounded horses will be sold at a public auction, with the proceeds dedicated to covering the counties’ impounding costs before any leftover proceeds go to the ISPMB. As soon as the words “kill market” left Aberle’s mouth, Eckrich interjected and said he needed no further explanation of the agreement. Sussman attended the hearing without an attorney and spoke only a few one-word answers to questions from the judge. Afterward, she continued her practice of declining interview requests but gave the Journal a lengthy, full-page written statement that contained her first extensive comments on the controversy. Burns has told the Journal she complained to Sussman and some board members last summer about conditions on the ranch, but no corrective actions were taken. Burns then took her complaints to authorities and the media. Sixteen pages of written and photographic documentation that Burns posted to the internet on Sept. 30 included images of emaciated horses, some with grotesque wounds or injuries and some with wildly untrimmed hooves. An investigative report attached to Tuesday’s impounding agreement bolsters Burns’ claims. The report, filed by a veterinarian working for the state Animal Industry Board, is based on a Sept. 14 visit to the ISPMB ranch. The veterinarian noted some healthy horses but also noted a number of thin horses, including some that were “nosing through the dried manure looking for remaining hay,” and some with the overgrown hooves and medical conditions described by Burns. The veterinarian also encountered an open burial pit containing more than 25 horse carcasses, which he was told had accumulated over the past several years. But he noted that some carcasses appeared to be fresher than that. The veterinarian offered a damning summary at the end of his report. Aside from the impounding proceedings, Sussman also faces a pending grand theft charge in nearby Perkins County regarding a $9,394 check she wrote to a hay supplier which authorities say bounced.